Are you a fan of traditional German wheat beers? Skip the pint and step up your glassware game with this schooner beer glass! Are you a fan of traditional German wheat beers? Skip the pint and step up your glassware game with this schooner glass! The barware experts at Libbey have done it again. This 21-ounce schooner glass is exactly what you need for an authentic presentation of your favorite wheat beers, and the heavy-duty construction is strong enough to stand up to all the toasts you can handle. Beyond beer, the Schooner Glass is also ideal for use with your favorite cocktails. Because of its large bowl and decorative appearance, it may be used for serving margaritas and festive tiki drinks. It’s time to treat your wheat in a way that can’t be beat. Grab yourself a schooner beer glass today and you’ll wonder how you ever lived without it! The thick glass design really holds cold temperature after storing in freezer. And, I suspect it might resist chipping / breaking from normal use. Fast shipping, best prices and good communication! Great glassware, only wished they were a little bigger. They were delivered very quickly. My husband was obsessed with having a "margarita" glass just like the ones in the restaurant. I looked everywhere for them & finally found them here. He loves it! Drank from a mug at a restaurant like these and loved them. we enjoy drinking ice cold beer with lime rim in this type of glass. 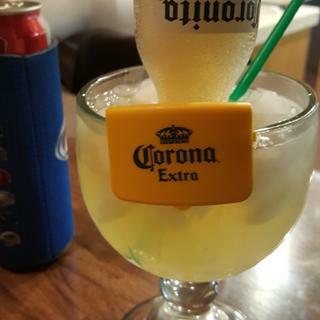 Works best with the CoronaRita blue drink clips. I love drinking out of these glasses. Beer stays cold for a good amount of time when they are stored in the freezer. Put them in frezzer then add beer the next day. What the dimension of the upper bowl part? BEST ANSWER: Hi Edgar, the bowl diameter is 4.25"